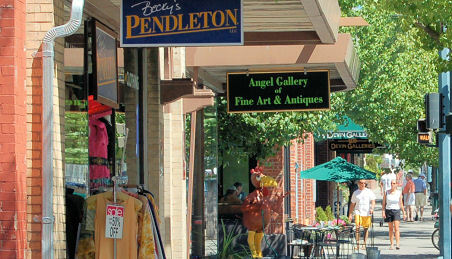 Spend the day shopping in Coeur d'Alene, a wonderful experience with the unique shops, boutiques and antique stores in the downtown area. Explore this page for a complete list of shops. Cisco's II. 212 N. 4th Street, Coeur d'Alene, ID 83814. Phone: 208-765-7997. Pack Rat Estate & Junk Store. 812 N. Coeur d'Alene, ID 83814. Phone: 208-966-4307. Camera Corral. 515 E. Sherman Ave, Coeur d'Alene, ID 83814. Becky's Pendleton. 421 E. Sherman Avenue, Coeur d'Alene, ID 83814. Phone: 208-664-7002. Finan McDonald Clothing Company. 210 Sherman Avenue, Suite 147, Coeur d'Alene, ID 83814. Phone: 208-765-4349. Just Because. 210 Sherman Avenue, Coeur d'Alene, ID 83814. Phone: 208-665-7378. Marmalade Fresh Clothing. 117 S. 4th Street, Coeur d'Alene, ID 83814. Phone: 208-667-6967. Velvet Hanger. 413 E Sherman Avenue, Coeur d'Alene, ID 83814. Phone: 208-664-6461. Coeur d'Alene Resort Logo Shop. 115 S. 2nd Street, Coeur d'Alene, ID 83814. Phone: 208-666-9021. Daisy J's Trading Company. 210 Sherman Avenue, Coeur d'Alene, ID 83814. Phone: 208-765-3300. Floral Design & Home Décor. 6680 N. Government Way, Suite 2, Coeur d'Alene, ID 83815. Phone: 208-773-355. Marketplace Gifts. 210 E. Sherman Avenue, Coeur d'Alene, ID 83814. Phone: 208-667-2962. Mix It Up. 601 Front Avenue, Suite 102, Coeur d'Alene, ID 83814. Phone: 208-667-8603. Pier 1 Imports. 410 W. Wilbur Avenue, Coeur d'Alene, ID 83815. Phone: 208-762-7859. Super Silver. 414 E. Sherman Avenue, Coeur d'Alene, ID 83814. Phone: 208-667-8170. Silver Lake Mall. 200 W Hanley Avenue, Coeur d'Alene, ID 83815. Phone: 208-762-2113. CDA Pipe & Cigar. 416 ½ E. Sherman Avenue, Coeur d'Alene, ID 83814. Phone: 208-664-0786. Skin Deep Couture. Silver Lake Mall: 200 W. Hanley, Suite 1401, Coeur d'Alene, ID 83815. Phone: 208-762-2233. Figpickels Toy Emporium. 210 Sherman Avenue, Coeur d'Alene, ID 83814. Phone: 208-667-2800.